"Shelling in the proximity of Duma, Eastern Ghouta today, is putting the UN/ICRC/SARC convoy at risk, despite assurances of safety from parties including the Russian Federation. Today’s convoy entered Duma to deliver the remaining aid that could not be offloaded from Monday's convoy due to insecurity and ongoing fighting. The UN calls for a cessation of hostilities in the area and for calm throughout Syria so that aid can be safely delivered to people in need," Ali Al-Za’tari, UN Resident Coordinator and Humanitarian Coordinator in Syria said in a statement obtained by Sputnik. A checkpoint in Syria's Eastern Ghouta was shelled half an hour after the humanitarian corridor was closed, nobody was injured, spokesman for the Russian center for Syrian reconciliation Maj. Gen. Vladimir Zolotukhin said Friday. "Around half an hour after the humanitarian corridor in Eastern Ghouta was closed, the Muhayam al-Wafidin checkpoint was shelled by militants… Nobody was killed or injured," he told reporters. Numerous civilians gathered in an additional checkpoint opened in the south of Syria's Eastern Ghouta, trying to leave the de-escalation zone, according to the spokesman for the Russian center for Syrian reconciliation Maj. Gen. Vladimir Zolotukhin. "The Syrian authorities opened an additional checkpoint in southern Eastern Ghouta… There is a large gathering of civilians in neighboring areas wishing to leave the de-escalation zone," he told reporters. According to the official, militants, seeking to prevent civilians from leaving, are attacking them near checkpoint continues during humanitarian pauses. Several people have been injured and killed. 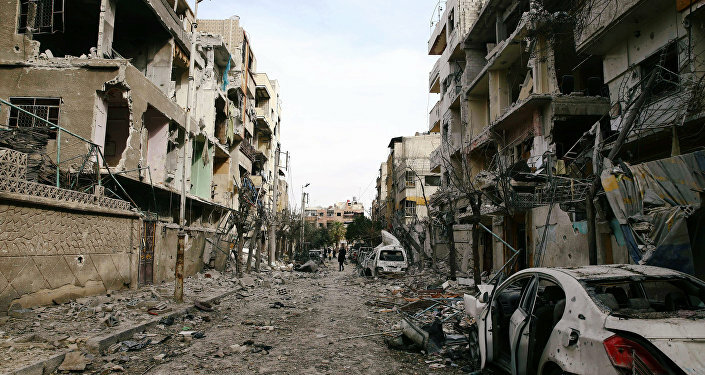 "Shelling of Damascus and closest suburbs continued. Militants launched 18 mines from Eastern Ghouta, injuring two civilians, in the past 24 hours," he stated. The humanitarian situation in Syria has significantly worsened due to the ongoing civil war. The infrastructure has been damaged or destroyed across the country and millions of people have left Syria in order to escape violence and poverty caused by war. International organizations have been providing humanitarian aid to the Syrian population, especially to those living in such crisis-torn areas as Eastern Ghouta. Eastern Ghouta was seized by militants in 2012. According to Syrian Army calculations, there are 10,000-12,000 militants in the region. Despite the recent UN resolution, the fighting has not ended, even when the humanitarian pause was in place, the Russian Defense Ministry's center for Syrian reconciliation said. As militants constantly target all exits from the enclave, civilians have been unable to leave the area.